Fouling the Footway? In the Falklands? When I first visited London, in my distant youth, I stayed with a late friend’s family in the working-class district of Chingford. One day, as we walked around his neighborhood, I was amused by a metal sign that read “Dogs Fouling the Footway/Byelaw Penalty £5/Clive G. Dennis, Town Clerk” (I am a committed dog person). In fact, the euphemism so amused me that my friend thought the sign would make a great souvenir and, one night, we liberated it from the fence to which it was attached. I brought it back to California with me but, sadly, it has since disappeared (I’d happily pay £5 for a replacement). Stanley's 800-quid fine should deter scofflaws. I have a visual reminder of it, though, in a photograph of a sign outside the cemetery in Stanley, in the Falkland Islands, where I spent more than a year in 1986-87. 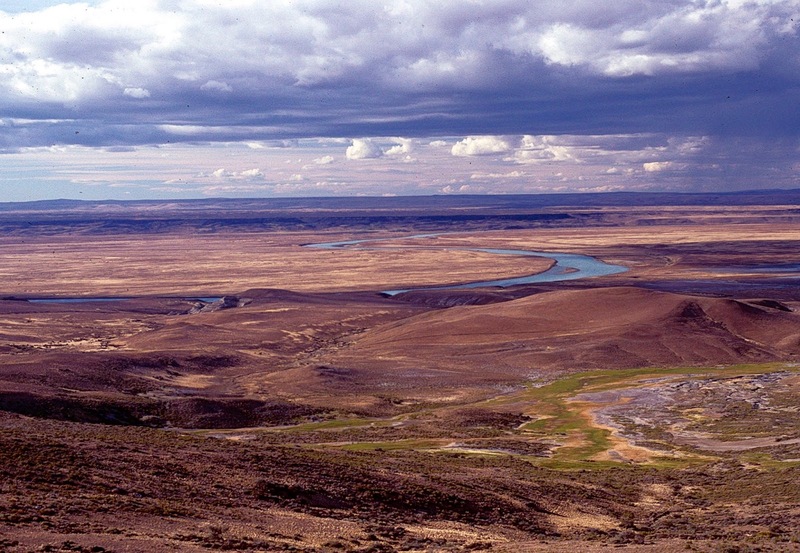 At that time, though, Islands dogs were working dogs on sheep farms—pet dogs were rare in town, and I only recall a couple lapdogs belonging to elderly people. 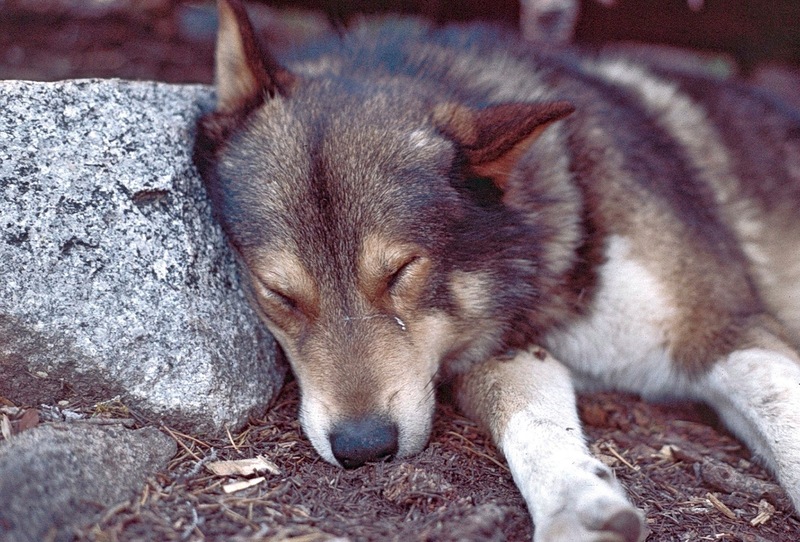 Concern over hydatidosis, a liver disease for which dogs are a vector, discouraged the ownership of pet canines. Cats, of course, were common, but many households also had pet lambs which, in time, became pet sheep. Some friends of ours had one they mischievously called “Dinner,” though nobody would ever dream of eating a pet lamb (even in the “Camp,” or countryside, pet lambs were untouchable). These weren’t watchdogs—not that anybody needed such security in Stanley—but they did serve a function as living lawnmowers. 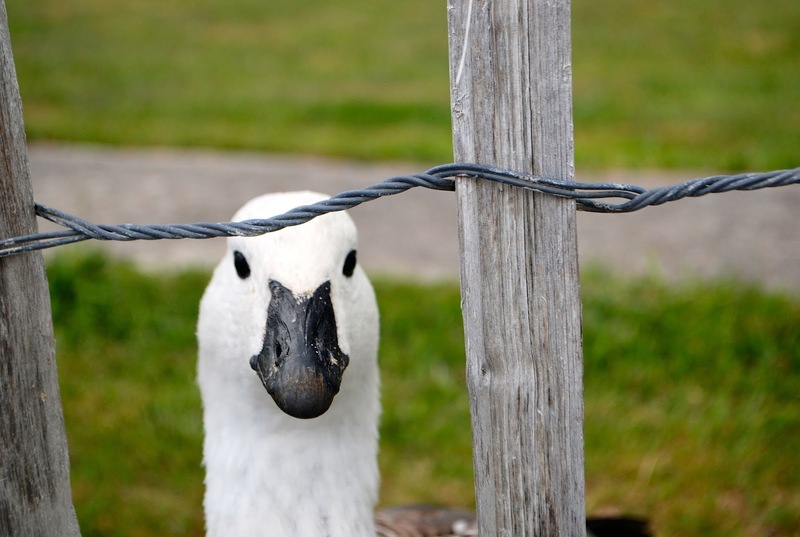 Deuce the watchgoose will attack through the stakes and wires of Ray and Nancy's fence. Today it’s more common to see Stanleyites walking their canine charges, though dog ownership does not remotely approach London levels. There are no stray dogs, however, and it’s still unusual to see a dog unattended even in a fenced enclosure—though that doesn’t mean there’s nothing. For example Deuce, the upland goose that my friends Ray and Nancy Poole have raised since he was a wild gosling, goes ballistic whenever I approach their house. Still, while his droppings may foul the lawn, they do not reach the footway. While I’m on the topic, I’ll address the issue in Buenos Aires, another city with an enormous number of dogs and a reputation for notoriously irresponsible owners who often let their pets dump on the sidewalk. Sometimes, when I see such an event while walking around town, I’ll hand the owner a plastic bag with the comment “Se te cayó algo” (“You dropped something”). They’re surprised (and often embarrassed), but usually thank me. 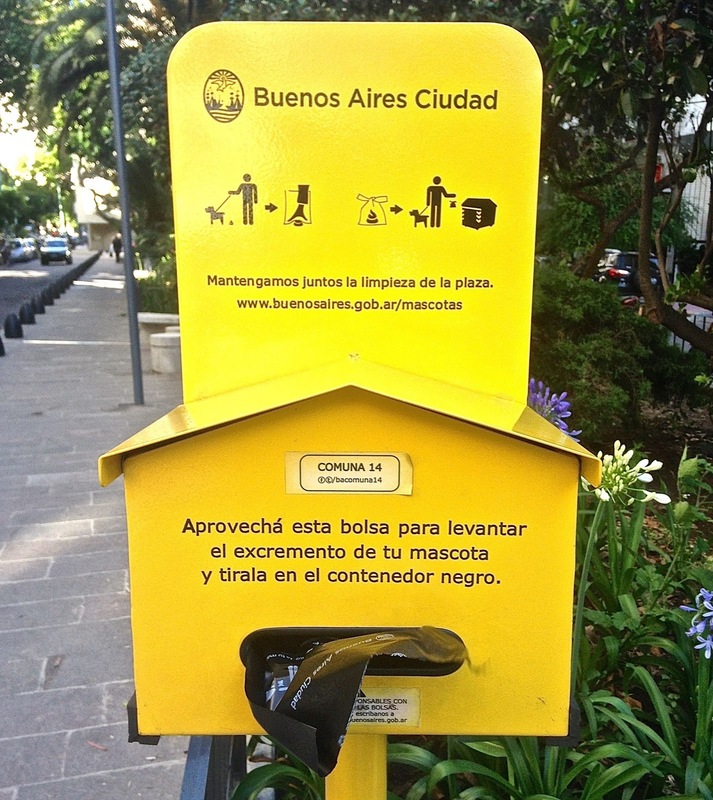 Still, Porteños are more responsible than not so long ago, and there’s official recognition of the issue—at strategic locations throughout around town, such as our neighborhood in Palermo, the city has begun to place dispensers for bolsas soreteras (as I call them). Earlier this month, the world’s most prominent religious figure made international headlines when Pope Francis acknowledged that, in his early forties, he had regularly visited a Freudian psychoanalyst for several months. Now 80, the Pontiff wouldn’t reveal the reason for what, statistically at least, would appear to be a midlife crisis, but his position and celebrity made this a high-profile story. 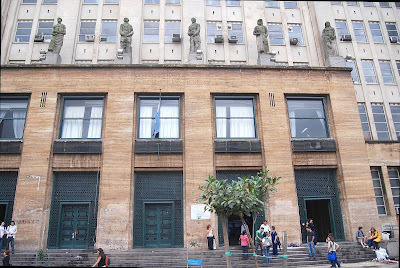 The Facultad de Medicina at the Universidad de Buenos Aires is a hotbed of Freudianism. 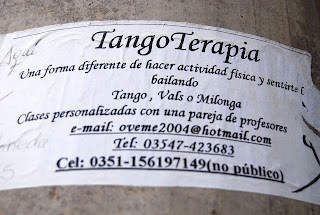 "Tango therapy" may be an option - Francis was a dancer in his youth. 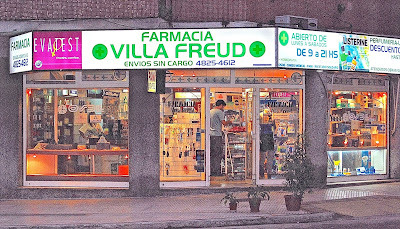 Clients purchase their meds at Farmacia Villa Freud. Therapy, though, is not just a function of recent times; it began with the 1930s arrival of Jewish refugees from Europe. Historian Mariano Ben Plotkin has chronicled this tale in Freud in the Pampas: the Emergence and Development of a Psychoanalytic Culture in Argentina (Stanford University Press, 2001). 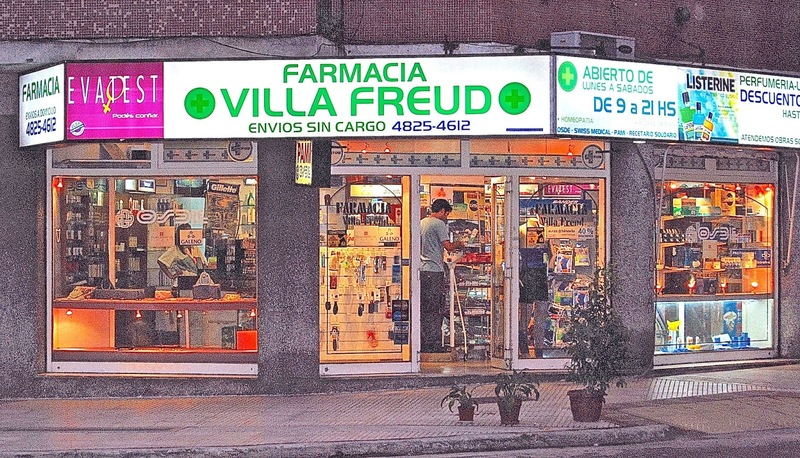 Many of Buenos Aires’s thousands of shrinks practice in Palermo’s so-called Villa Freud, where their clients can top off their meds at the Farmacia Villa Freud. One online magazine specializes in listings for professional office rentals, and even acting classes are often exercises in therapy. In 2002, the Centro Cultural Borges paid Freud a month-long homage. Institutions add to the therapeutic ambience. The Asociación Psicoanalítica Argentina once organized a month-long exhibition on “Psychoanalysis, Culture and Crisis” at the Centro Cultural Borges. The Museo de Psicología Experimental Horacio Piñeiro recounts the experimental efforts of an early-20th-century pioneer. 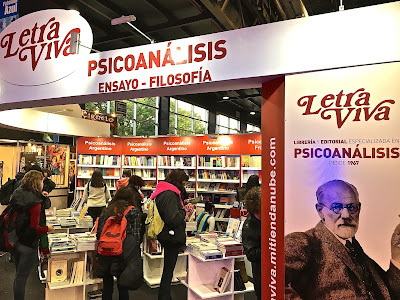 Villa Freud’s everyday literary locus is Librería Paidós, an inconspicuous bookstore in a small shopping gallery, but the annual Feria del Libro always shows the latest in psychoanalytic scholarship. 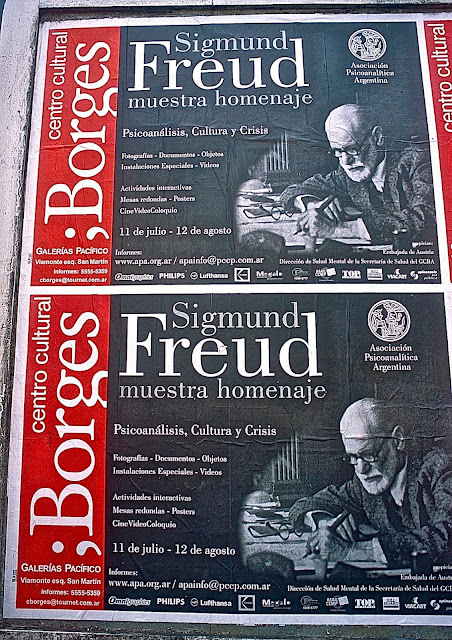 Amateur and professional Freudians crowd the display at Buenos Aires's 2016 book fair. 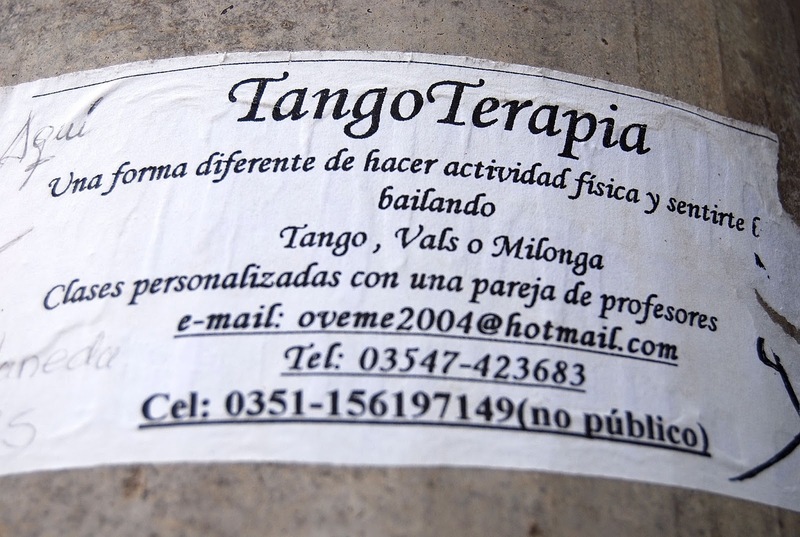 In Argentine cinema, therapy is no less common than in Woody Allen films—in Rodolfo Durán’s 2007 comedy Terapias Alternativas (Alternative Therapies), an apathetic loner psychoanalyst winds up unexpectedly caring for his own son by a brief relationship and simultaneously sharing accommodations with a suicidal patient. Woody himself is a great favorite, for that matter; he once even suggested he might film in Buenos Aires. "Help Me, Dr. 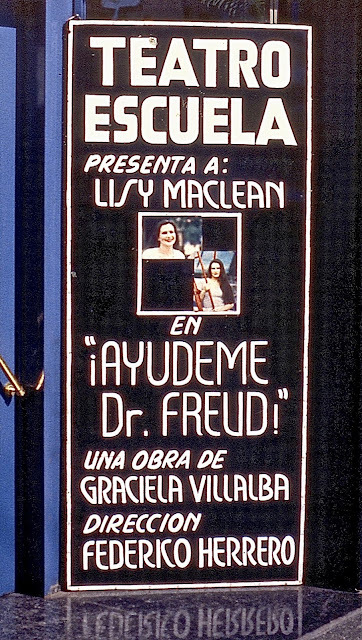 Freud!" 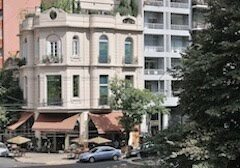 - a stage play in downtown Buenos Aires. Not that long ago, a hit play on Avenida Corrientes went by the title Therapy…If Only Freud Could See This, but such matters are not always humorous. In the summer of 2010, after junior lightweight boxer Rodrigo “The Hyena” Barrios killed a pregnant woman in a Mar del Plata hit-and-run, he took several hours to surrender to police, apparently to avoid alcohol and drug tests. In the ensuing days, he managed to remain free on bail as he underwent “psychological testing,” but he is currently in prison. 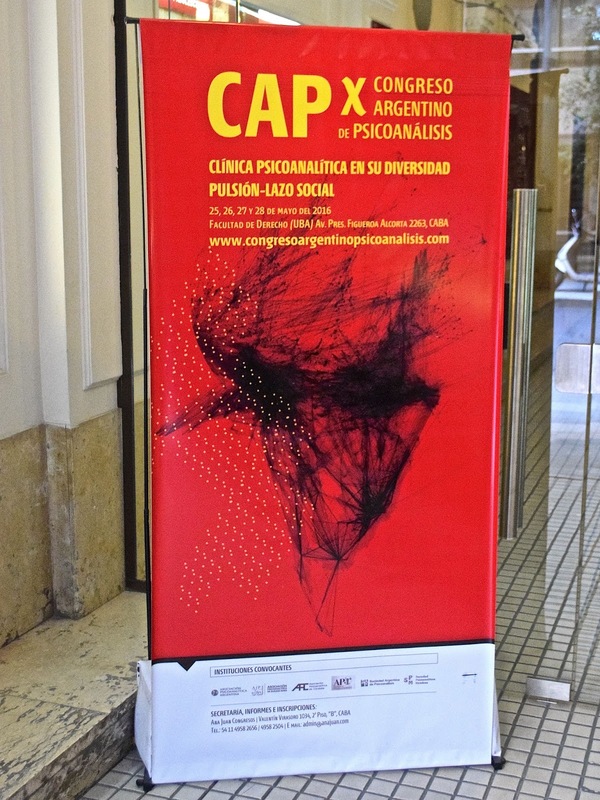 A year ago in May, the Argentine Psychoanalytic Congress held its annual meetings in Recoleta. Where the Pope fits into this context is open to speculation. Might it be that, in his midlife crisis, he harbored doubts about the existence of a supernatural being for which there is no empirical evidence? Freud, after all, dismissed theistic beliefs as a collective neurosis. 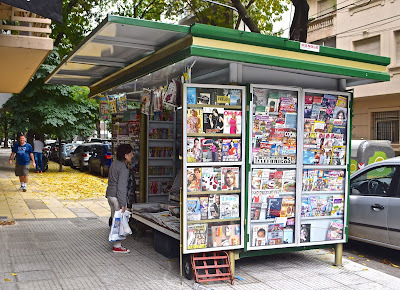 At the end of July, the venerable Buenos Aires Herald surprised me—and lots of other people—by shutting down after printing and posting one last Saturday edition without so much as a formal farewell. Shortly thereafter, I wrote my own mini-obituary of the paper, but I soon heard reports of a resurrection. 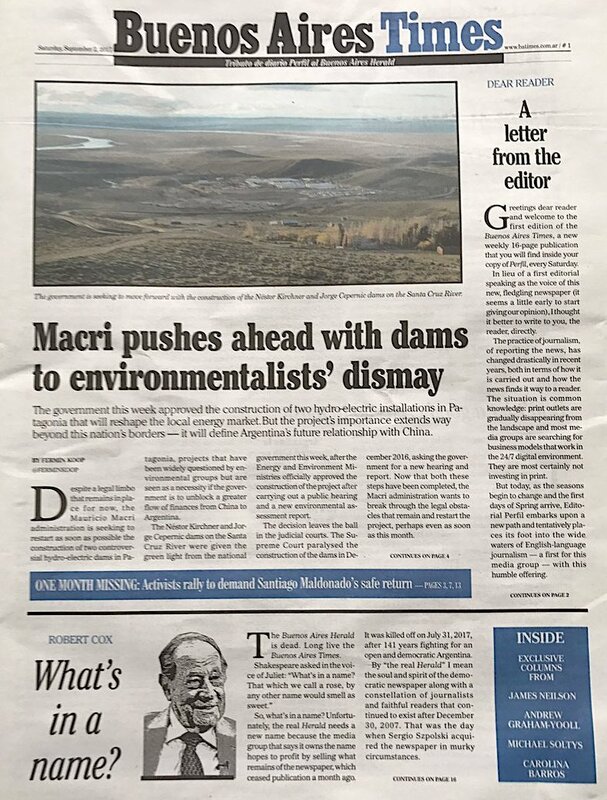 Patagonia's long and meandering Río Santa Cruz, under threat from a pair of hydroelectric dams, is a featured topic in the first issue of the Buenos Aires Times. The first also included critical and analytical pieces on topics such as controversial dams on Patagonia’s largest wild river, prospects for the Argentine economy, and significant news stories from around Latin America. Contributors included former Herald editors Andrew Graham-Yooll and Carolina Barros, and senior editor Michael Soltys. All things considered, the Times’s rollout was stunningly quick, and there’s some evidence that it was rushed. For all that, there’s a reassuring familiarity starting with the paper’s masthead, which is virtually identical to the Herald—almost to the point of wondering whether there could be copyright issues. The story fonts, however, appear rather different. Many if not most porteños get their print news fix from corner kiosks. 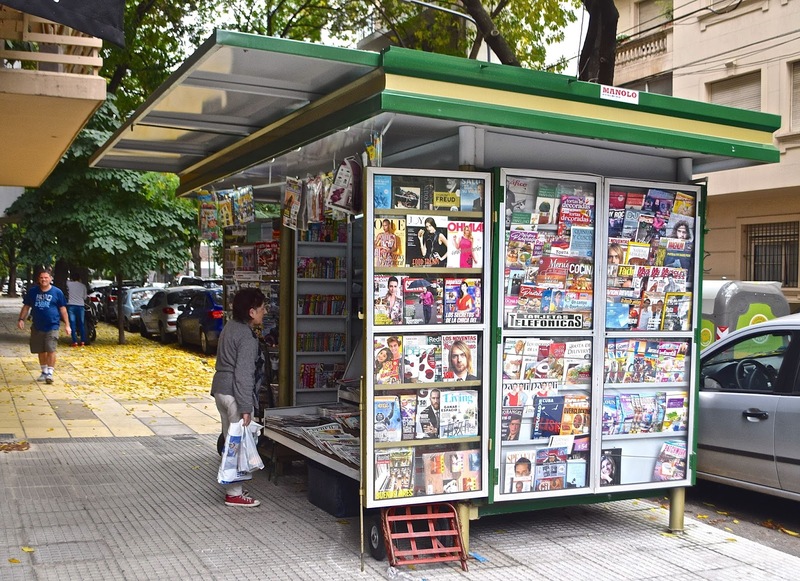 Maybe it’s partly print nostalgia but, when I return to Buenos Aires in November, I’ll be looking forward to waking up on Saturday morning, walking to the corner kiosk and purchasing Perfil—with its BA Times insert—to read with my breakfast. My only concern is that, with its aging staff—many are in their sixties and seventies, and Bob Cox is 83—the paper will have to recruit younger talent to survive.